Three Generations of Art on Show. An exhibition celebrating three generations of water-colour and acrylic painters. Entry by Gold Coin Koha. 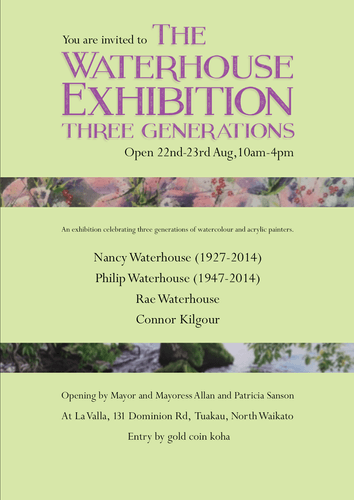 An exhibition by Tuakau painter Rae Waterhouse, but it will also showcase the work of Rae’s late mother Nancy Waterhouse and late brother Philip Waterhouse, who both passed away in 2014. Rae’s granddaughter Connor Kilgour, who lives in Wellington, will also come on board as a first time exhibitor.